Acceleration is typically measured with piezoelectrical (IEPE / ICP) accelerometers if high frequency response is desired (2 kHz and above) or with MEMS accelerometers if lower frequencies and constant acceleration is of interest. In both cases MonoDAQ offers total solution including sensors, data acquisition modules and software. 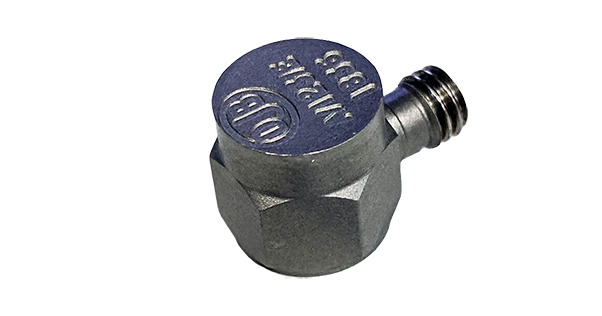 Precise measurement of high frequency vibration requires the use of piezoelectrical accelerometers that have usable frequency response up to 20-30 kHz. Those accelerometers use the piezoelectric characteristic of a crystal to generate electrical signal. A small mass is placed betweeen a spring and a piezo crystal. As it is subject to acceleration, it generates force against the crystal that is proportional to the acceleration and mass. A force acting on the crystal in turn outputs electrical charge. How to measure the signal from piezoelectrical accelerometers? 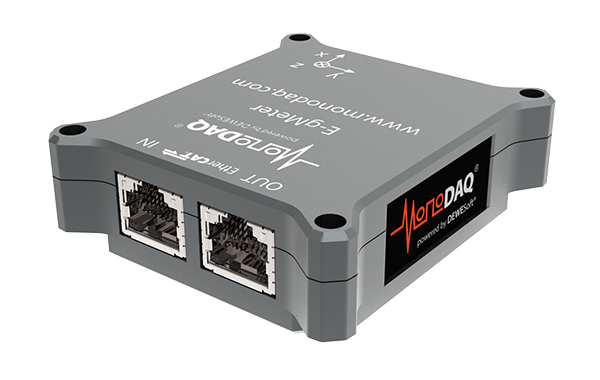 In case of IEPE / ICP accelerometers the charge signal is amplified by an integrated electronics and converted to analog voltage that needs to be converted to digital using an IEPE signal conditioner like MonoDAQ-E-ACC to display the measured values in a user-friendly environment like DEWESoft software. Even though the measurement chain consists of an accelerometer and a data acquisition device, the TEDS protocol ensures that the calibration data from the sensor is automatically taken into account in software. MEMS accelerometers measure the change in capacitance between a sprung proof mass and base as the proof mass is displaced under acceleration. MEMS is a technology that enables such accelerometers to be etched out of silicon on a very small scale, hence the name MEMS accelerometers. How to measure the signal from MEMS accelerometers? The majority of MEMS accelerometers output analog voltage that needs to be measured and converted by an ADC (analog-to-digital converter). 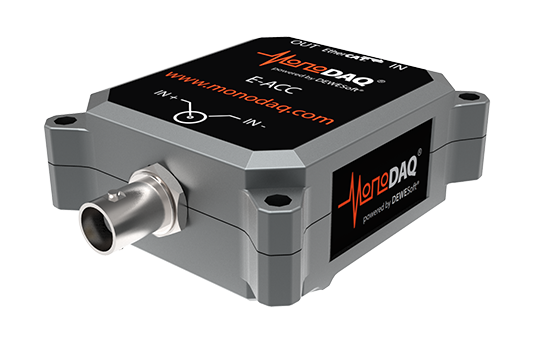 In case of a MonoDAQ-E-gMeter, a triaxial MEMS accelerometer is embedded into a data acquisition device that is simply connected to a PC by a network cable using EtherCAT protocol. A user-friendly DEWESoft software for data recording and analysis is included in the package.